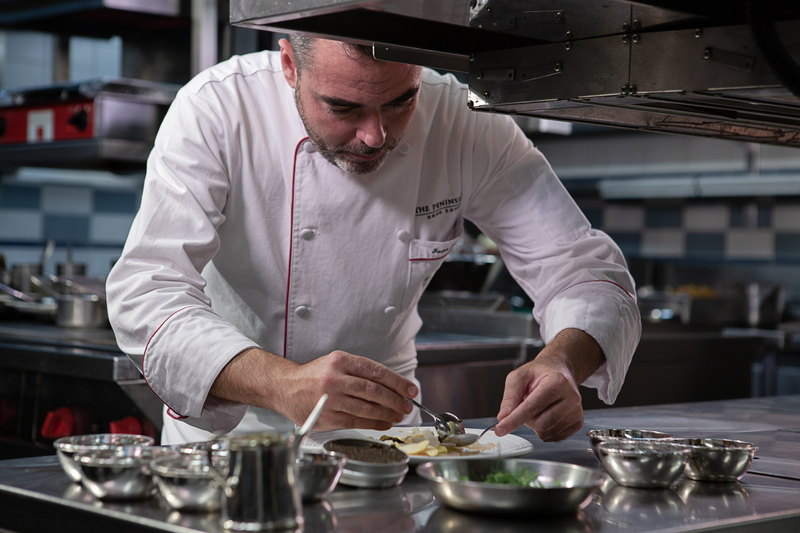 The latest addition to The Peninsula Hong Kong’s culinary team, chef Juan Gomez is a seasons Spanish chef who’s set to bring an exciting new experience to Felix, the hotel’s modern European eatery. 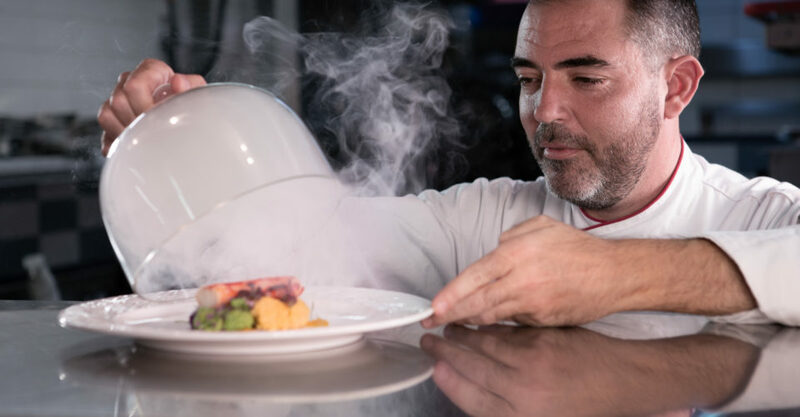 His roots may be in Spain, but Juan Gomez brings over 30 years’ experience from across the world — including the UK, Australia, the Maldives and Dubai — to Felix. The Loop HK spoke to him about living that chef life and what he hopes to achieve during his stint at Felix. Well, it was rather easy for me. My father was a chef (although my mother used to cook better!) while my godfather and close relatives were linked to the industry. I started as a teenager when I was 14 years old, helping my father with banquets in a family-owned hotel in Barcelona. It was my dream to become a chef one day. What do you think are the most important attributes for a chef? In general, you need to love to eat, and you need to respect the products and be curious about discovering new flavors, combinations and textures. However, there are a few other attributes that makes the great difference between a good and a great chef. You need passion to delight your guests with gracious hospitality, the same way you pour your heart into curating an experience for guests in your own home. Creativity is important — it’s the spirit that a chef will have to share with the culinary team, to guide them and motivate them into thinking out of the box. Respect is crucial — you have to respect your guests, your team, your ingredients, your products, basically everything! You also have to be able to sacrifice. Being a chef is never an easy job. You need to work hard, long hours when your friends might be enjoying a day off. You will sacrifice time with your family and friends, you’ll get hurt in the kitchen, and your legs hurt after hours of standing. Finally, you need taste and style to be able to make your dish look great – it’s like dressing to impress. It’s essential to keep up with new trends in plating and presentation, and to polish your technique constantly to deliver “wow presentations that go along with the concept of your creation and the character of the restaurant. To you, what makes a great dish? To me, it is a combination of things, like a recipe. You need 200 grams of a great idea or concept that blends flavors and textures. Add 300 grams of a great ingredient or two (or three!) and 150 grams of creativity for plating, taste and style. Throw in one teaspoon of craziness and a heavy dose of lots of passion. I love to work with seafood, but I’m also a big fan of beef and vegetables. It’s very difficult for me to name only one single ingredient! More than a single ingredient, to me, the essence is to work with ingredients that are in season. The weather and seasonality affects you personally, and in a broader scope of what you would like to prepare and offer to your guests. For example, I love asparagus in March, and fresh peas or artichokes in April, black truffles in winter or white truffles in November, not to mention amazing Spanish tomatoes in summer or mushrooms in Autumn. The list goes on! You got your start in Spain. What do you think makes Spanish cuisine so unique? The first thing that comes to my mind is something that I can also observe in Hong Kong (which I love) – our passion for eating and food. On top of that, the products we have in Spain are amazing, from sea to land to vegetables. The diversity of traditions and cultures for a not-so-big country is very special to me. Apart from that, we have a generation of chefs with Ferran Adria and the Roca brothers, along with many others, who together bring Spanish gastronomy to the top from a very humble beginning with an authentic revolution to the industry. I’m very proud of to be a part of this amazing generation. What Spanish influences have you brought to your work at Felix? One of the things that we introduced to Felix is a selection of seasonal tapas to complement your cocktail or drink – a rather distinct Spanish influence. And we also brought some Spanish products such as Rubia Gallega, or the Iberian ham. As for the character of the restaurant, I am proud to bring with me happiness and passion, introducing a “fun” and playful element in the menu, from the Parmesan lollipop and king crab pillows to the vanish raviolis and “Break the Felix Wall,” a dessert which you can smash with a hammer. You’ve spent 30 years working across the world in places like the UK, Australia, the Maldives and Dubai. What important lessons did you learn from these experiences? I believe working overseas does make a person wiser, in a sense, as it gives the opportunity to move away from your comfort zone, to find the inspiration from another approach to life, and to me, it teaches me to be humble and take life as a continuous learning process. You learn a lot from every single culture or country you live in, you learn to respect everyone and their differences, and to appreciate the multicultural background of the team. You learn something new every day. It makes you feel very proud of your roots, culture and identity, which allows you to respect the heritage and culture of others. You worked closely with Felix’s Mixologist, Marko Petrovic, to create the “Stage of Cocktails,” a selection of signature cocktails designed specifically to be enjoyed alongside your tapas menu. Why do this? Was it something you thought was particularly important to do? When I first met Marko, I was very happy to see that we both share a fiery passion in what we do. With this as a foundation, we started to play around and noticed the similarities shared by the world of mixology and gastronomy. We believe that together we will come up with a perfect match when the two worlds collide. Where did you find inspiration for this tapas and cocktails pairing? The inspiration for the tapas comes mainly from the product – in this case we give classic combinations a creative flair in flavors, such as pairing Campari or bitters with smoky, sour ingredients like smoked sardine with ginger and yuzu. Working so closely with Marko is also very comforting – he can be a source of inspiration. We are both passionate and sometimes we would meet in the evening to discuss and explore an idea, and stay till the end of service, trying to mix and match till we get the perfect fabric of textures and flavors. How have your global experiences influenced your cooking style? One of the pillars in creating a new dish is your knowledge of gastronomy, cooking style and ingredients. Having the privilege to work in a variety of different environments is definitely a plus — it is like you have a wider choice of color palette than people who are constantly working with the same tone. What do you hope that guests take away from their experience at Felix? I want our guests to have fun, to enjoy and experience the journey. I want to surprise the guests and make them feel special. And of course, I hope they will remember the experience and come back! Could you tell us a little about the changes to the menu you’ll be introducing at Felix? We’ve created a menu which stimulates the senses — it is a five-course menu with each dish featuring one specific sense. It is a creation for the guest to enjoy and experiment with an interactive experience (dessert) inspired by the sense of touch as the perfect closure. Apart from that, we are also introducing some seasonal products as rhubarb, fresh peas and artichokes, as well as the “Black Market angus beef” M9 or Black cod. For us, it is important to keep the creativity alive, and to motivate the team in coming up with new ideas, shape the ideas and make that work. That is the reason why we are creating the chef’s special, which is a selection of three to four recommended dishes that change every two weeks, with a combination of some of our much-loved signature staples in the menu. We call it the continuous process of creativity! Continue to be a happy chef! A Dishin’ the Dirt profile.